After two elections with surprise results, each proving I was right to worry, the collected politicians of both the US and the UK are promising to do something about infrastructure. So here I attempt to investigate what that is, how it is valued and what small changes are declared to be good. In Britain we have daily arguments about spending on two particular projects, another runway at Heathrow and the rail link HS2. What is not in dispute is that we need greater air capacity in Britain and that we need a faster, more effective rail network. Our big problem is with vested interests, what can be called nimby attitudes. ³ The long-term effect of such an attitude is that we never spend enough on any change – we build the smallest, cheapest solution, which is, at the time of completion, already too small and too late. One problem is the time it takes to drive a project forward. In Britain. Immediately close to my house in Tyneside is the junction between the A19 and the A1058. The A19 includes the Tyne Tunnel, so providing the east coast major trunk route northwards avoiding the heavily used A1. The A1058 connects the coast with the city, ‘the Coast Road’. The junction is currently a roundabout on the A19 and a bridge on the A1058. What is needed is through routes for both trunk roads. The plan to change this junction was mooted before 2000 and we have begun construction in 2016 with completion likely in 2018. There are several issues with this; the plan offered in 2000 dealt with projected flows, which of course have changed as patterns of living and transport change; the disruption to the area while the work proceeds does damage to the businesses nearby while the work is on; other construction work nearby adds significantly to the disruptive effects. This is simply an example of the problems to do with infrastructure. You may not be aware who pays for this. In England trunk roads are maintained by Highways England, which is funded with central government money. The adjustments to non-adjacent slip roads on the A1058 are funded by local government, viz. Tyneside District Council – local money. 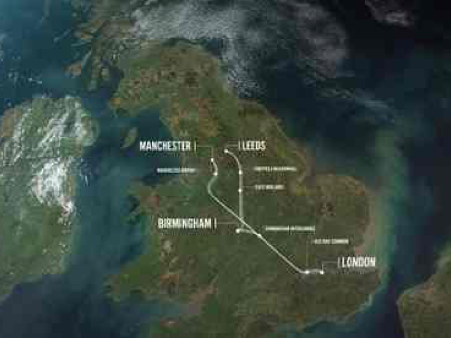 HS2 is a plan to upgrade the rail system, map above, between London and Birmingham. The incoming government , pre-Brexit, declared a big push to develop northern England, coining the phrase ‘northern powerhouse’. HS1 connects London to the Channel Tunnel. The idea of HS2 is to triple the traffic volume. Phase one London to Birmingham, phase two onwards to Leeds and Manchester. See here. The HS2 trains would then continue northwards on older track and at slower speeds to connect in Newcastle, Edinburgh and Glasgow. Work has started late 2016 with a projected finish in 2026 to Crewe in 2027 and to Birmingham in 2033. I say that this is far too slow, that it has always been too slow. I say that politicians are proven incapable of spending on anything that lies beyond the life of their brief time in parliament and that this is palpable failure. Therefore it is something that should be subject to far less political interference. Perhaps we should change the way we fund our transport networks. It is undoubtedly true that by the time the project reaches completion there will be better technologies that we could have / should have used. The nimby attitudes that slow down every step towards any solution to a transport problem serve only to make the issue worse – I say they point to a failure of the compulsory purchase system and that if the perception was that land purchased by the state for state purposes was very well rewarded (by a premium) then that would improve the rate of progress in ways that justify the additional spending. It will continue to fail those marginally affected (close enough to be affected by the change but not affected enough for compensation to be paid), but then it is time we addressed that issue too. One of the regular complaints is that any line is largely unavailable to those who live close to it. Of course this is true, because of the requirement for speed. We have such an issue with motorways and that is exaggerated with rail and even more so with air travel. The complaint, at heart, is the perception of a loss of quality of life, itself largely indeterminate. That translates into noise, nuisance and perceived loss of value of land or other capital possessions. Perhaps we should be paying for this along the lines of compulsory purchase; again, I say that speed of progress is a significant part of the problem, so that dealing with these nuisance factors might well constitute worthwhile spending. Each time we improve a transport facility there is a knock-on effect. The improvement occurred, almost always, to address a current problem. It is rare to have infrastructure change to solve a predicted, future problem, though one might point to the roads to Telford and Peterborough and Milton Keynes (new town developments on a large scale) as running contrary to the norm. Where the development is retroactive then, as already stated, there is the disruption to an already bad situation while the work is completed – it gets worse before it gets any better. However, once better, the local situation has changed and so the perceived ease of transport is then used as a tool for people to move outwards in order to benefit from use of the facility. Example: when living in Cambridge in the 70s the roads north and south were upgraded in the north-south direction by the M11, by upgrades to the A10 and A11 and along the A604 to join the A1. Thus we found ourselves drawing a map of travel time with the new road and thence a map showing the drop-off of house value against distance from the money-work source of Cambridge. We then balanced the cost of travel in resources against the amount of house we could buy so as to find an optimum solution, resulting (1979-83) in a 30 minute drive and a house more than twice the size for similar money. We noted that many people subsequently made a similar decision, so that now that same drive is more like 50 minutes, mostly because access to—and parking within—Cambridge is a serious problem. The airport services in England need improvement, but they always do. Our house in Stockport is under the flight path into Manchester airport and I testify that improvements to plane noise levels mean that this is not intrusive in the way it was 40 years ago. At the end of the 60s I had friends living 5 miles north (of me) and under the flight path into Newcastle airport. Even now, this is no great centre for air travel, but I remember that things would fall off shelves as planes went overhead; and yes, I am comparing (Manchester and Newcastle) similar distances from the runway. So I say matters have improved, as they should. UK Aviation forecasts, Dept Transport Jan 2013. 1 Demand for air travel is forecast to increase within the range of 1–3% a year up to 2050, compared to historical growth rates of 5% a year over the last 40 years. The slowdown in growth rates in the future reflects the anticipation of market maturity across different passenger markets and a projected end to the long-term decline in average fares seen in the last two decades. 2 The central forecast, taking into account the impact of capacity constraints, is for passenger numbers at UK airports to increase from 219 million passengers in 2011 to 315 million in 2030 and 445 million by 2050. This is an increase of 225 million passengers over the next 40 years compared to an increase of 185 million since 1970. 3 The central forecasts of passenger numbers have been reduced by around 7% in 2030 from levels last forecast by the DfT in August 2011. Primarily this reflects revisions to the Office of Budget Responsibility's (OBR) forecasts for the UK economy and the Department of Energy and Climate Change's (DECC) projections of oil prices. 4 The major South East airports are forecast to be full by 2030. However, there is a range around this projection and they could be full as soon as 2025 or as late as 2040. Heathrow remains full across all the demand cases considered. 5 CO₂ emissions from flights departing the UK are forecast to increase from 33.3 MtCO2 in 2011 to 47 MtCO₂ within the range 35–52MtCO₂ by 2050. • Research has repeatedly found that there have been two key drivers of passenger choice of airport: the costs of traveling to airports; and the frequency of services offered at airports. • When the number of passengers choosing an airport exceeds the capacity at that airport, the model increases the cost of using that airport. This has two effects: (i) some passengers will choose an alternative airport and (ii) other passengers will choose not to fly. In both cases the demand will drop back to capacity at the congested airport. The model will iteratively increase the costs at all congested airports until no airport exceeds its input capacity. • The forecasts take no account of the Brexit vote. The October 2016 OBR publication also makes no adjustment for the Brexit result. • Adding no new runways in Britain is reflected—the difference between constrained and unconstrained models—in a difference of 5 million flights per year. Models vary; the 2011 forecast for 2030 was 20 million higher and the 2009 one 90 million higher. Most of this change is due to a drop in UK GDP, an ‘economic downturn’. This says to me that we see a need for at least 5 million more flights per year somewhere easily accessed by Londoners. Further, the provision of surplus capacity tends to encourage growth towards that capacity, in a similar way to having better roads encourages more traffic. What we cannot measure at all easily is how increased capacity helps growth. The converse situation also applies, in having growth restricted by a lack of capacity. Which causes me to think of India, which, when I visited it still had no motorway. A quick check says that, while in 2012 that was still true, in 2016 there is 100,000km of limited-access motorway, 26,000km of which is 4 or more lanes. It is important to distinguish the limited access element and for that to be genuine, actual non-access by pedestrians and animals. That change within India partially answers what I thought I saw there in 2006 and in South Africa in 2003, that a lack of transport infrastructure in turn drove a need for IT infrastructure in compensation. India has clearly found that these are not alternatives, which in turn may be telling us all that the demand for travel, the movement of goods and people for business and leisure, is not significantly displaced (in those countries) by good internet and telephone connections. Which is a pity, because we have been forecasting such change for many years. Perhaps that is another essay topic. • capital expenditure on airports varied in 2000–2010 between 0.8 and 2.1 £billion. Should this not define an expected level of expenditure? Whose expenditure is this? • Figures for investment in seaports are much more difficult to come by. The trade view is that annual investment averages about £200-300 million, but with large year-to-year variation on account of the occasional major development like the current project by DP World. Including logistics parks and similar infrastructure, this suggests that total investment by the private sector in terminal facilities of one sort or another during the last decade, was around £20 billion in current prices. By comparison, capital investment by the public sector in the English strategic road network (motorways and trunk roads) over a similar period is about two-thirds that figure. •..because of the development of communications technology such as smart phones and the use of personal computers, the practice, particularly in the context of rail projects, of treating all business travel time as unproductive time has been questioned. And so it should be; it is difficult to work while driving but very easy to work while on the train, just not while waiting for it. Conversely, one can sometimes be productive while waiting at an airport. Saved leisure time is very different from saved business time, at both a personal and national level. •-------- research ran up a side street at this point, looking how uk.gov appraises projects. The Airports Commission has claimed, and the media has uncritically repeated, that a new runway at Heathrow would deliver ‘up to £147 billion benefit’ for the UK. But this figure is based on analysis that takes no account of the environmental or surface access costs of expansion, and that the Commission’s own specialist economic advisers have criticised for double counting and questionable assumptions in relation to the indirect benefits associated with increased seat capacity. Investment in infrastructure is universally agreed to be a primary ingredient in the facilitation of economic growth and/or diversification, irrespective of where in the world such investment takes place. However, what is often missed from this conversation is that the appraisal systems put in place to estimate future ‘value’ or ‘benefit’ for money invested are so typically rigid that local and regional socio-economic circumstances are effectively removed from the calculation. I write this blog from a UK perspective, having particular regard to the rigorous and world-renowned appraisal methodologies spear-headed by the Department for Transport which have been developed and refined over many years to measure the relative costs and benefits of wide ranging transport proposals. Whilst these methodologies are sound for the purposes for which they have become established, they remain timid in terms of addressing the broader and less direct benefits and costs of infrastructure investment. Yeah, right. This is asking for a value to be put on the worth of the project for less tangible reasons, which I’d call emotive or political or even the cost of making progress. What we don’t have enough of is that push that, for example, says to all Londoners, “We need another runway, the country is better off if it is at Heathrow, hard luck”. And shut up. Or one says “Putting another runway in at Heathrow is too hard, let’s look somewhere else entirely. When London complains, we tell ‘em their complaint level is why we’re not doing this thing in London. Make it part of the devolution thing”. Infrastructure is not only transport, it is also energy; water, waste water, flood risk and coastal erosion; solid waste management; and communications. What triggers the recognition of a need to change infrastructure? Mostly it is some measure of capacity; in the case of transport networks the trigger is congestion, by which we mean that the demand for the network exceeds the supply, often to the point where the network then fails to function. Since it takes a long time to make change occur, then as a nation we need any change to occur before breakdown occurs and so we need measures of congestion that cause us to trigger planning. In the short-term the solutions lie in encouraging people to change behaviour (travel off-peak, use a different transport network, change expectations), but long-term congestion requires more investment. 1 programs in the US, where in the UK that spelling can be used for computer programs, and the longer programme for theatre menus, planned events. Both words refer to what is at heart a list of items. You might enjoy the idea of a political programme as “a planned series of future events or performances”, a suitably political definition in the modern era. 3 nimby, acronym for Not In My Back Yard. Used to label all those locals who campaign against change nearby. I have seen this close up and personal; it is uniformly people who have a comfortable life that assume the rest of the nation is irrelevant (at least to them). They want to use infrastructure but at the same time will give nothing towards it, not even tolerance. 4 Snow at home would not close the road at six but the traffic on similar roads might well close them by seven. A sun near the horizon is right into the eyes of one going east in the morning and west in the afternoon; typical English weather at that time of year would provide wet roads most of the year at around the freezing point, so while by the standards of other countries this is not anything significant, actually when the temperature keeps around zero the conditions are pretty horrible. In part, because some find the weather difficult to take sufficiently seriously. So it was not uncommon for me to arrive at school, having travelled the furthest of all members of staff, to find that school was declared closed – after I’d arrived. The weather never stopped me arriving at school. 5 from http://www.heathrow.com/company/company-news-and-information/company-information/facts-and-figures, which says Annual air transport movements in 2015: 472,067; Daily average air transport movements in 2015: 1,293. Looking for comparable figures for the next two busiest airports, Manchester has a maximum of 61 air movements per hour, 23.1 million passengers in 2015 (Heathrow, 75 million, Gatwick 38 million, Stansted 20 million) See wikipedia. and here. • The public sector should learn from the continual experimentation of the private sector and address the quality issue by exploring the different preferences that travellers have for different attributes of the transport service. Consequently, when adding capacity, it should offer travellers a choice of different price-quality bundles, in the manner of the de-regulated aviation sector. • Segmentation of the transport market and the introduction of priced options provide an opportunity to add smaller and less expensive tranches of capacity while achieving equal if not higher levels of overall benefit. • Rail commuters, for example, could be given more choice regarding the quality of service and the cost of fares. An additional high-density ‘economy class’ section could be introduced on commuter trains, access to which would be priced during the peak at a large discount to current fares. From the resource cost point of view, there would be more passengers on a standard- length train without the recourse to high levels of taxpayer-funded investment in expensive new infrastructure. • Motorists could also be given more choice. The development of the strategic network should allow for priced alternatives running parallel or close to congested roads. These alternatives could place an emphasis on features that add value over and above their potential for reducing travel time, for example by offering reliable, hassle-free journeys on routes or lanes free of heavy goods vehicles. • Congestion is endemic across both the rail and road networks. As a result, travellers often experience a degraded quality of service in the form of overcrowded trains or long queues of traffic. • The government is seeking to address these problems through public spending on transport infrastructure. It is assumed that such expenditure will reap future dividends by boosting productivity and contributing to economic growth. • Political intervention and perverse incentives mean, however, that there is a high risk that resources will be squandered on poor value schemes. Weak control over capital costs, bad management and lack of accountability are also symptomatic of the non-commercial approach of the public sector. The problems associated with government transport investment are exacerbated by shortcomings in the appraisal methods used to evaluate projects. • The transition from the market driven, privately promoted, risk-taking infrastructure provision prior to the 20th century, to the politically influenced welfare economics approach of today, has had the effect of breaking the important nexus that formerly existed between the choice of a project, the quality of service it was to provide and the pricing of its use. • I find this entire paper to be far too personal and political where what I want to read is something divorced from politics addressing need and the causes of need. As Starkie says himself in his introduction, in the final part of the paper, I give specific examples of how to add value to transport networks by introducing market segmentation, first in relation to investment in rail capacity and then to road investment. The transport reference point here is the liberalised air transport industry where competition and enterprise has led to a broadening of product choice for the consumer (Chapter 9). In relation to rail, I address the specific problem of overcrowding during the peak and suggest that by investing in a new product which is sold at a cheaper price all rail commuters might benefit whist achieving considerable savings in capital expenditure compared with current investment strategies (Chapter 10). In relation to roads, I focus on the congested strategic network and suggest that road users have varying travel preferences which can be segmented to allow for the provision of more specialised road infrastructure (Chapter 11). Last, I note that there is an issue with the letter combination fi, possibly where there is a soft hyphen: difficult copies as dif cult , specific as speci c and so on. This is, fortunately, not a hi-fi (re)production. The Approach includes identification and assessment of problems, identification of options, and the assessment of those options. Throughout this process, the Approach works within the framework of the NATA criteria mentioned above. The writing of this essay had difficulties with staying in British English. I’m writing in iWeb under OS x Sierra and Office 2016 is on my machine. I have the region set correctly, I know where to look for preferences and I’ve had this issue on earlier Apple systems. The solution—the new difference—was to look at preferences in the Dictionary app and move British English to the top of the list of dictionaries. I have no American dictionaries selected, no American English left as an option. And I’ve not turned on Mandarin on this machine, as the lady wife is expected not to use it.